When you buy a new bicycle one of your first choices will be where to shop.Do you go to your local bike shops, a Superstores or online ? If you do decide to buy from your LBS you will have the local bike shop advantage. Bicycles aren’t like any appliance. Bikes arrive unbuilt, in boxes. They must be assembled and set up correctly. Proper assembly ensures you have a safe and fun experience.You may be interested to know that we have years of experience in fitting bikes to riders and we’ll get yours fitting so good it disappears beneath you. You might be surprised to learn that bicycles are not completely assembled at the factory. It’s true. They’re actually delivered to us disassembled and in a box, and we spend about an hour just assembling, setting up and testing every bike (at no additional charge to you). Once you’ve decided on a bike , after careful consultation with an experienced salesman , it is vital to purchase the right size bike for you. The bike must be set up and adjustments made to ensure the frame is the correct size . Ome must ensure that the seat and handlebars brake levers and shifters are properly positioned. This ensures comfort and safety. There are many choices, too: If you want a softer saddle, we’ll fit one for you. If you prefer to sit more upright, we can find a solution for you. We want your new bike to be as comfortable to ride and as easy to pedal as possible. Remember, every new bicycle will need a minor tune-up after several weeks of use. We offer this as a “first free service”. So for these reasons, we feel shopping at a good specialty bicycle store in your town is the way to go. 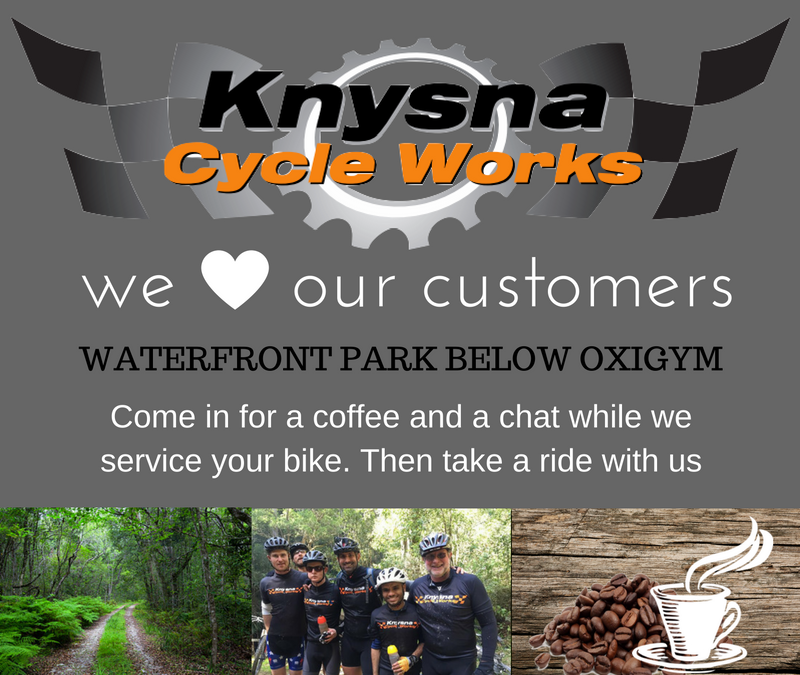 At Knysna Cycle Works we have competent salespeople and expert mechanics who’ll ensure that you get the right bike and the correct set up. We have years of experience in fitting bikes to riders. We’ll get yours fitting so well you will have a super cycling experience. You will find friendly knowledgeable and enthusiastic cyclists who love to share expertise . A top of the range workshop wiil service your bike after your purchase. Also, we don’t just send you out with the bike . Do you need to learn how to use your gears, fix a puncture, or how to inflate your tires? We will show you . Let us take you on rides to gain confidence on your new bike . Our passion will become your passion ! We will show you the best local places to ride and introduce you to friends to cycle with with. We have different cycling groups and clinics for youth , ladies and more experienced cyclists. Bike repair clinics are also on offer to groups . You’ll learn the best ways to care for and fix simple problems on your bike – on the trail and at home. So, this is your local bike shop advantage .Just ask us, and we’ll be more than happy to help.